Brain tumours are fortunately fairly rare, but to be diagnosed with a brain tumour is often a frightening and daunting experience. There are over 100 different types of brain tumour, but there are only a few types that are most common. Brain tumours can be either benign or malignant (cancerous) and can affect people of all ages. For almost all brain tumours there is no known cause. In general, lifestyle factors such as diet, smoking, chemical exposure, everyday radiation (including mobile phones) have NOT been clearly shown to be risk factors for developing a brain tumour as they have been for some other cancers. Brain tumours develop from cells that acquire gradual mutations in their DNA and then these cells divide and grow, outside the normal controls, but what causes the initial cells to become abnormal is unknown. Brain tumours are usually found because they can cause persistent severe headaches, seizures or sometimes a neurological deficit, such as weakness in an arm or leg or vision or hearing loss. 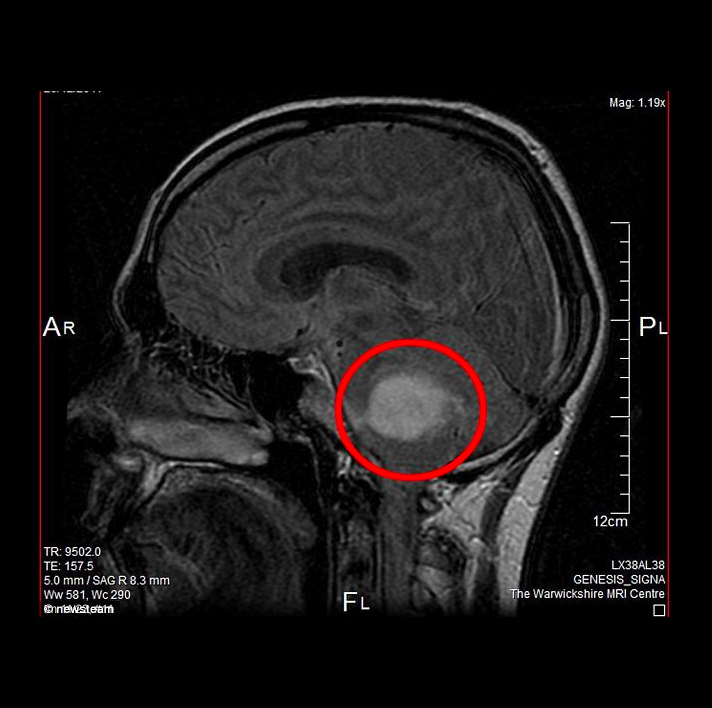 Brain tumours are diagnosed by brain imaging (CT and/or MRI) and usually an intravenous injection of ‘contrast’ agent is given at the same time to see if the tumour enhances. Meningiomas are benign tumours that arise from the meninges, the membrane that lines the brain and the spinal cord. Rather than growing in the brain tissue itself, these slow growing tumours generally push the brain away. Meningiomas are usually removed via an operation (craniotomy), where an opening is made in the skull and the tumour excised. Sometimes the tumour can be completely excised and hopefully cured, but occasionally this is not possible because the tumour is deeply located, or very close to critical nerves or blood vessels. In this case, the remaining tumour is usually followed over the next few years with regular MRI scans to check for any changes. If there is continued growth, further surgery might be an option, or otherwise, the patient may be referred for radiation treatment. At the present time there are no effective drug treatments for meningiomas. Acoustic neuromas, also known as vestibular schwannomas, are benign tumours that occur on the hearing nerve in the posterior part of the brain. Patients generally notice a gradual decline in hearing in one ear or other symptoms such as tinnitus, or balance disturbance. The decision about how and when to treat these tumours is complex and takes into account many factors such as the size of the tumour, the degree of hearing loss, the age of the patient and of course the patient’s own wishes. In some instances, the best option is just to watch and wait and follow the tumour with regular MRI imaging. If treatment is decided upon, this can be via surgical removal, or a “one-off” treatment of high dose targeted radiation (“radiosurgery”). The pros and cons and risks of these approaches will be discussed with you in full to help make the best decision. Either way, these tumours can often be treated successfully and have a favourable long term outcome. Glioblastoma is the most aggressive type of brain cancer and unfortunately, one of the most common brain tumours. It arises from glial cells (astrocytes) within the brain and tends to grow quite rapidly and invade widely throughout the brain. For this reason it is extremely rare that this tumour can be cured by surgery. Surgery is usually necessary for two reasons (1) To obtain biopsies of the brain tumour tissue to confirm the diagnosis and (2) to remove as much of the tumour as possible to reduce the swelling and pressure effect on the brain. After recovery from surgery, patients are usually referred for radiotherapy and chemotherapy which is now usually given concurrently (at the same time). The radiation therapy generally involves once-a-day treatment for about six weeks, whereas the chemotherapy is a tablet that is taken on certain days. Although this modern regimen of treatment has been proven to be effective and to improve patient survival, research efforts around the world are actively looking for better therapies for this aggressive type of cancer. Metastatic tumours describe those tumours that spread to the brain from cancers in other body sites. It is thought that single cancer cells can break off into the blood stream, and travel up to the brain, where they lodge and start to grow to form a tumour. The most common cancers that spread to the brain are lung cancer, breast cancer, bowel cancer, melanoma and kidney cancer, but other rarer types occur also. If a metastatic deposit is in an accessible area of the brain, then it can often be removed successfully with a craniotomy operation. Sometimes this may be followed by a course of radiation therapy to the brain. Other options for treating a metastatic tumour are with targeted (“stereotactic”) radiosurgery. Decisions regarding how and when to treat a metastatic brain tumour are often made in conjunction with a patients treating oncologist.